What is the best forms automation software for small business? 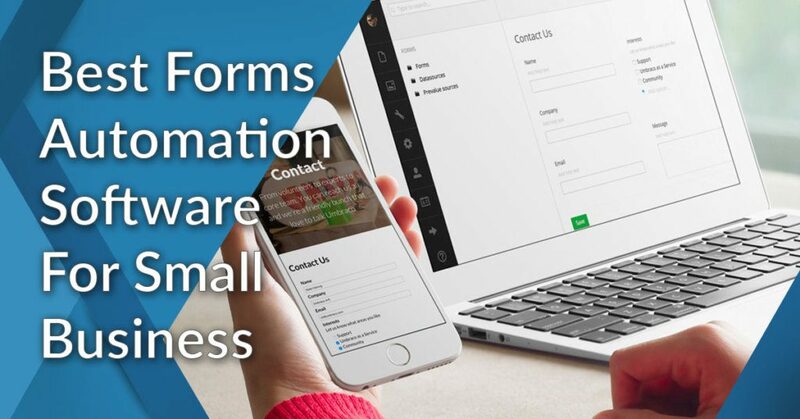 The best forms automation software for small business is ProntoForms. This widely-used easy-to-use forms automation tool allows business users to be in control of complicated job processes. With its drag-and-drop features, users can create fillable forms, build business workflows, and easily combine back-end processes to hasten results. In today’s highly competitive global market environment, businesses depend on innovation to remain competitive. However, employees tend to be short of the needed stamina and time to be creative in order to achieve innovation whey they are compelled to consume most of their working hours performing cumbersome, repetitive, low-impact tasks manually. To empower individual employees and teams to drive innovation at the workplace, they must be set free from doing those low-value, recurring job assignments. Thanks to technological advancements, one way to do so is through forms automation solutions. These robust applications have been proven to significantly reduce the time and effort that workers must exert to complete many repetitive tasks and even reduce human errors that are inevitable in manual processes, among other advantages. This article is meant to provide you a number of helpful insights and an expert’s take on some of the best forms automation tools in the market today. What are 12 Best Forms Automation Software For Small Business? Business process automation is expected to be central to the upcoming stage of digital transformation. Business automation technologies like forms automation tools are predicted to elevate customer value to greater heights, such as increased convenience, more extensive personalization, higher reliability and quality, and quicker delivery of services and products. 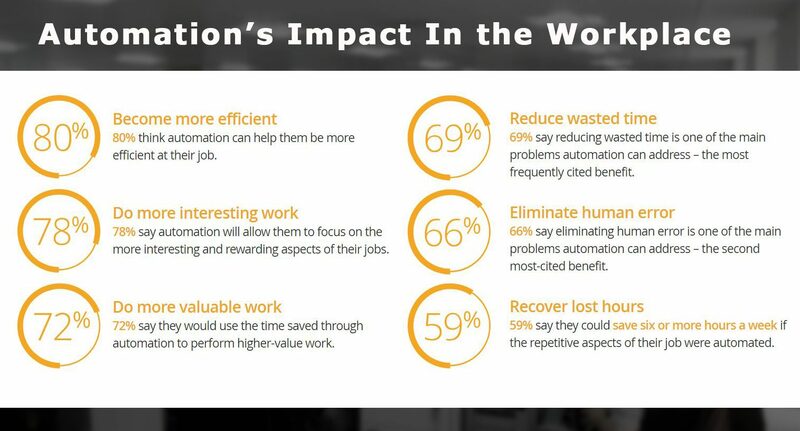 Despite the apprehension that increased automation might force people to lose their jobs, one report on workplace automation indicates the opposite: that 97 percent of workers themselves think that they will benefit a lot from automation. The benefits of forms automation for a business is immense, both for your employees and customers. Let’s consider, for example, that your employees spend around 2 hours a day performing manual activities and repetitive tasks, which can be automated. That is equivalent to 10 hours a week or around 40 hours a month of lost hours per employee. If you have, for instance, 100 employees, so that will be a total of 4,000 wasted hours a month or 166 days lost by your business to manual tasks that could be automated! Using forms automation, especially the 12 leading tools that will be presented in this post, offers small businesses a wide array of advantages. With these powerful tools, small businesses can acquire the capability to seamlessly connect with their clients, provide them great user experience, increase the possibility of converting leads into actual sales, and much, much more. You can find more info about forms automation tools here. ProntoForms can be considered as one of the most advanced mobile form builders in the market today. Its easy-to-use drag-and-drop mobile form builder allows you to get complete control of intricate processes in any business operation. This intuitive and flexible solution can be used as a mobile front-end to systems of record or as standalone tool to automate repetitive tasks and processes. What makes this automation tool a choice solution for small businesses is that it is enterprise grade but does use complicated codes, making it easy and quick to deploy. This feature-rich platform empowers you with full control in designing your forms, enjoy the convenience of user-friendly navigation, decide for your automatic triggers to follow-up alerts or new jobs, securely transmit data to your business systems and company storage, communicate with customers via email, and send SMS notifications to stakeholders. You can easily try out this smart forms automation tool when you sign up for a ProntoForms free trial here. ProntoForms also offers a host of other benefits. Aside from allowing to create elegant, professionally-designed forms, you can also integrate dynamic, intuitive automation features to your business forms. For instance, you can use its innovative “if This, then That” feature to allow you total control of UX and dictate how form inputs will be triggered by particular actions. It also provides you the convenience of real-time access to your various business data sources as well as time-saving solutions that your teams can use at the office and even when on the go. Pardot is another popular forms and marketing automation tool for small businesses. Made to work seamlessly with Salesforce CRM, this automation solution is packed with powerful features yet easy to use due to its smart dashboard that even novice users can readily employ to automate their daily tasks. Its graphical automation branching and drop-down menus make this intuitive automation tool a good choice for B2B transactions. This automation tool allows you to perform many repetitive tasks to achieve efficiency and save time. By eliminating the need for constant manual support, you can build lists, campaign rules, contact tags, and come up with lead-scoring packages that automatically send the correct notifications to the correct recipient. You can try this app when you sign up for a Pardot free demo here. This platform also has a clean user interface, and properly-labeled icons and tabs to help you to complete more tasks in a shorter time. With its native integration with Salesforce application suits, smart dashboard, and an extensive list of features, Pardot is a sound option for your forms automation needs. Form.com is an all-around, all-in-one forms automation platform that helps users to quickly deploy process enhancement and data gathering applications for businesses. This smart app provides a number of intuitive electronic forms to take advantage of going paperless, benefit from using mobile forms, and help streamline your business process through smart automation. With Form.com, you can significantly enhance the efficiency and speed of your core business processes while guaranteeing a single version of the truth. It also allows you to make your internal and external teams’ communication better using personalized workflows that transform how your teams, data, and forms work together as a single, unified business unit. You can also integrate Form.com with your current business systems to build a robust solution that can adapt to your existing infrastructure and optimize upon extant data. You can sign up for a Form.com free demo here. Paperform is an online form creator and forms automation solution that allows you to intuitively build your own well-designed online forms, product or payment pages fast. With its numerous features, this forms automation tool allows anyone—without the need for any training—to quickly start simplifying your existing systems using its hundreds of designer templates to automate your various business processes such as application forms, quizzes and surveys, client onboarding, payments, event registration, landing forms and lead capture. Using Paperform to make your own forms is easy because it’s like writing a document in your favorite word processor app. This is made possible by its quick and robust editor, which allows you to create innovative online forms where you can use styled text and insert videos and pictures to promote your brand and enhance user experience. What’s more, every form created using this tool automatically generates its own URL, which means you can readily share the form with your online site or even if you don’t have one yet. You can easily sign up for a Paperform free trial here. Zoho Forms is an online forms automation tool for businesses of any size. On top of creating and sharing online forms, this popular solution allows you personalize email triggers, better manage your business data using its integrated tools, and simply even the most cumbersome of your workflows through its smart automation functionality. Its form builder offers numerous customizable form templates and themes—with over thirty types of fields—so you can build virtually any kind of form you need for your business. Zoho Forms also enables you to share your form in private or publicly and even embed them on your websites and other online channels. It has a robust analytics feature as you can generate customized reports to help you put your business data in any order that you choose. It also allows you to quickly see how your forms perform, establishes the sources of your online traffic, and easily integrate your data with your favorite software solutions such as Salesforce and other Zoho suite apps. You can easily sign up for a Zoho Forms free trial here. Jolt is an integrated forms automation tool and inspection management software. It provides the crucial tools necessary report on operational deficiencies and to track their resolution statuses and histories through the creation of inspections and audit forms that can be customized based on the specific needs of the business. Fully customizable, users can build their own forms and inspections using more than 18 various item types, and configure when the forms should come out and their due dates. This forms automation tool also ensures that your teams are focusing on the core aspects of your business. Jolt enables users to easily modify compliance lists to help their organizations improve continuously. With one unified system to handle all automation and inspection processes, businesses can take easily conduct its various inspection activities, provide the needed visibility to each employee, and automate every manual task to reduce errors and save time. You can easily sign up for a Jolt free demo here. Form.com Restaurant Inspection is an intuitive mobile forms automation solution designed for restaurant management. Also from Form.com, this software integrates the mobile features needed to instantly identify and solve issues in restaurants at any location, including a robust analytics tool to determine and intercede for problems in international branches. It also helps restaurants enhance domestic operations, help staff remain updated on training and development programs and send key information fast to the correct individuals. This app is designed to enable users to reap more value from the otherwise low-value, ordinary restaurant inspections being performed. With Form.com Restaurant Inspection, you can boost customer experience by being able to regularly provide quality service to guests, ensure food safety, save time, remain compliant to existing laws, etc. It also helps franchisees strictly observe company standards and best practices. You can easily sign up for a Form.com Restaurant Inspection free demo here. KiSSFLOW is a comprehensive cloud-based forms automation and workflow management tool used by over 10,000 businesses to manage and simplify their operations. It allows users to build a limitless number of automated business applications using a single platform. Users have the option of creating their own automation tool or use its 45-plus pre-installed solutions to simplify various workflows such as travel reimbursement, purchase request, vacation request, and employee onboarding. This easy-to-use cloud forms automation platform has over 14 field types that you can customize according to your business preferences. KiSSFLOW allows users to automatically view the progress of any task or work item, quickly pinpoint problem areas, and generate customizable reports to address your workflow automation requirements. You can also easily integrate it with numerous third-party apps like Office 365 and G Suite. You can check out this solution more closely when you sign up for a KiSSFLOW free trial here. JotForm is a user-friendly web-based form builder for small and large businesses and freelancers. This smart tool allows to easily build online forms and quickly publish them. Each form has a built-in feature that enables you to receive an email for every response so you can conveniently gather data, create relevant reports, and make data-based decisions for your business. This easy-to-use online form automation tool also enables users to create professionally-designed forms on their own, without any prior training necessary. You can also personalize the forms using sophisticated styling functionalities to suit your brand. Users can save a significant amount of time and effort as using JotForm enables users to quicken and streamline their time- and effort-consuming everyday tasks through its smart automation features. It also gives users a simple, yet secure platform to collect payments, donations, and subscription fees online. TypeForm is an easy-to-use, innovative forms automation tool designed to help small businesses and freelancers better engage their audience to obtain more insightful market information. It uses the conversational, friendly tone to create its various types of forms like surveys in order to derive more answers from recipients than what forms and survey can normally obtain. Despite its rather unconventional approach for gathering data, TypeForm forms are easy to create, just like entering text in notepad. Its robust AI-powered predictive technology anticipates the questions as you type them, which helps hasten your form building process. Aside from a multitude of advanced functionalities and design options, it also provides users the convenience of seeing how the form looks with its Live Preview feature. You can even greet your audience with a “hello” in its Welcome Screen that can be easily personalized to your preference. IntakeQ is an online intake forms automation software for helping medical practitioners and organizations to securely send electronic forms to patients and receive them back ahead of scheduled appointments, providing you ample time to prepare. It is designed to optimize your operations by automating your intake processes by reducing paperwork, enhancing record keeping, which helps you save cost and time. HIPAA-compliant, IntakeQ offers numerous features to both streamline your business processes and significantly enhance your operations as a whole. This app supports e-Signature, apply your own branding, and can be integrated into your website. It also allows the conversion of your old forms into something new and more optimized, including the use of flexible question formats. Aside from enjoying the access to an unlimited number of form templates, it also offers several add-on services like appointment management, appointment, secure client portal, invoicing and billing, and client charts and timeline. Kizeo Forms is a simple, user-friendly forms automation and data collection solution designed to help professionals to digitalize their business processes. With numerous time-saving features, this online and mobile platform allows you to create professional forms and gather data in just a matter of minutes to help their professional services grow constantly, aside from saving time and increasing efficiency through robust automation. This tool allows small businesses and freelancers to easily gather rich data from the field and easily manage their workflows. Its analytics feature allows users to make evidence-based business decisions through the intuitive analysis of KPIs and other benchmarks. Users can also readily combine their business data with popular platforms like word processors and spreadsheets. We’ve presented above brief reviews about the best forms automation tools that our experts have chosen. In case you’re still busy with your business concerns and can’t find time to research these tools, why not first try our top-ranked forms automation tool and sign up for a ProntoForms free trial here? And before you go, you can also check out our 7 Free Forms Automation Tools to Collect Quality Leads For Your Business and you’ll definitely gain some additional insights on how to use these free applications to your advantage.